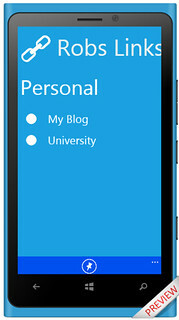 I think that Windows Phone Application Studio is a great tool for making little personal applications, and templates for bigger things. I spent some time playing with it, and made these screencasts which tell you a bit about the system. I hope you like them. 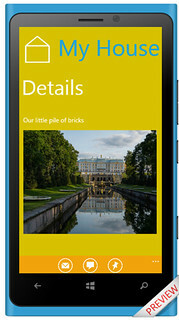 This is the first screencast about getting started with Windows Phone App Studio. It covers making and deploying your first application, and actually shows you to build something that is useful. You can find the screencast here. 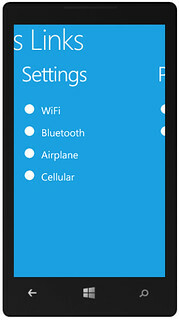 You can find the "Robs Links" application on the Windows Phone App Studio site here. You can find the Visual Studio Solution for "Robs Links" here. You can find the XAP file for "Robs Links" here. This screencast builds on the previous one (it seemed the right way to do it) and investigates how Data Sources work and how to use RSS in an App Studio application. 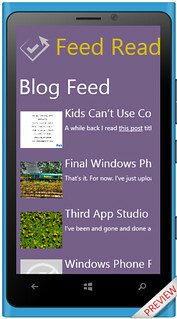 You can find the "Feed Reader" application on the Windows Phone App Studio site here. You can find the Visual Studio solution for "Feed Reader" here. You can find the XAP file for "Feed Reader" here. In this screencast I explore how to create HTML5 pages and how to use data sources to store information in an application. It includes some daring C# coding that I’m not sure whether I’m proud of or not. This looks in detail at how you can work with the Visual Studio projects that are produced when you make an App Studio solution. We create a template application with Application Studio and then modify the Visual Studio project that was produced to add extra phone functionality. You can find the Visual Studio solution, after I edited it, here. You can find the XAP file for the settings version of "Robs Links" here.